SUMMARY: Lifestyle brand and ecommerce store Dormify wanted to maximize the impact of its email communications by ditching batch and blast and adopting relevant, automated email series. By establishing a welcome, cart abandonment and post-purchase series, Dormify saw a 92% increase in email revenue, with the email audience converting at almost two times the site average. Dormify is a home décor lifestyle brand and ecommerce store dedicated to helping young adults style their small space, be it a dorm or apartment. Dormify seeks to offer these customers creative solutions, ideas and inspiration, all of which are available for purchase to help make the process of decorating space easier. Previously, Gardner said, Dormify had "definitely more of a batch and blast approach. We didn't have as much ability to segment as we do now. We also didn't have as many automated programs." For her and her team, it came down to the different needs of all of Dormify's customers. But as Dormify has grown, so has its audience — "whether it be somebody … decorating their bedroom at home or their first apartment or an off campus college apartment. On top of that, there are different segments when it comes to whether it's a parent shopping versus the student themselves," she said. Over the past year, Gardner and her team have been personalizing three automated email series: a welcome series, cart abandonment and a post-purchase. 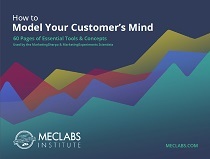 Segmentation based on email behaviors is something she has leveraged "quite a bit, in terms of being able to monitor people's behavior with what they're interested in within email," she said, adding that this activity helps split up the list in order to send appropriately to customers who are most interested in receiving a particular communication. Dormify's welcome series was constructed to do just that — welcome new email subscribers to the brand and to shopping on the site, Gardner said. "Since we are an up-and-coming brand, we recognize that even if somebody is subscribing to our email list, they might not totally get it quite yet," she said. Because of that, part of the series is an introductory offer followed by an "About Us" type of content, with a brief overview of who Dormify is and what the customer can use it for. "Then as a follow on, just giving our audience a way of getting to the right places on the website, so driving them into the categories that are awesome starting points for new customers in particular and exposure into our social media platforms, where you can find a lot of inspiration and ideas," she said. The second welcome email focused on social media, walking the customer through brand platforms like Pinterest, Instagram, Snapchat, Twitter and the blog. It also encourages them to "Meet our Style Advisors" — a network of students acting as style advisors — and apply to be one themselves. The third welcome email reiterates the 15% discount offer, and features a free design plan quiz for those who might need suggestions. The welcome series is both the first automated series and the first touchpoint for new email subscribers, and drives about 22% of overall email revenue, Gardner added. Dormify also has a shopping cart abandonment series in place, which follows up with users who have left items in their cart. "We leveraged some dynamic styling within that to show the user exactly what they had in their cart to give that extra boost of a reminder," Gardner said. One thing that is very important, she said, and especially shows in this series, is that "we try to make sure that our voice really shines through in all of our email communications. So whether it's the welcome series or shopping cart abandonment, we use fun language and try to keep our subject lines outside of the ordinary to really catch our customer." 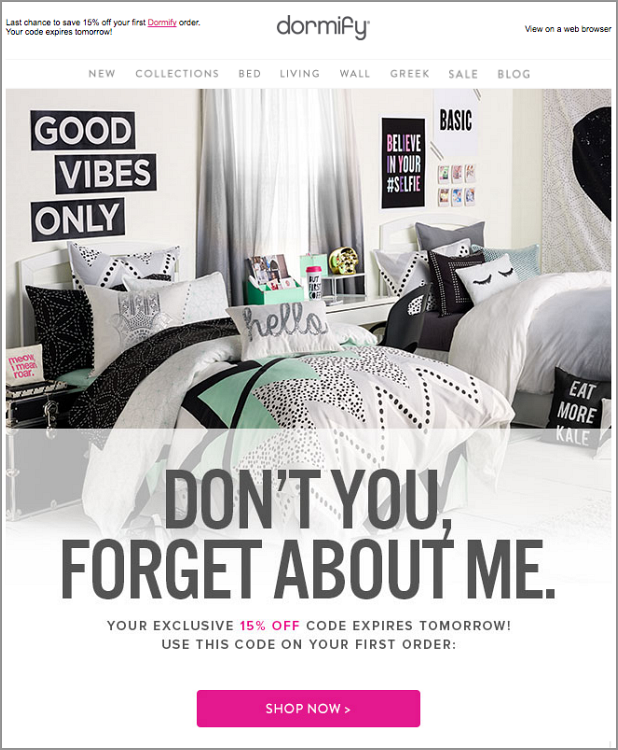 Each email in this series has a different purpose — the initial email in the series offers a reminder, and nudges the customer with a "Don't you forget about us" message. The second and third emails in the series contain a promotional offer. "We actually see that the first one does the best, because it's usually the quickest and most timely. But we have been able to, by launching a follow-up with an offer, get those people to convert that maybe were just on the edge," Gardner said. 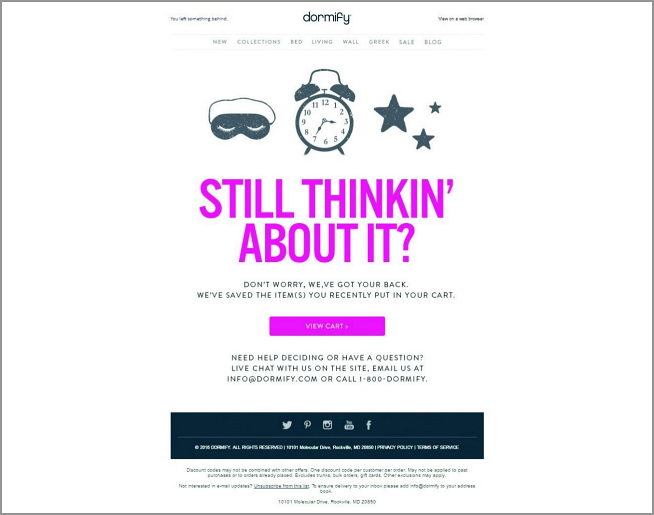 More recently (within the last six months), Dormify has put a post-purchase series into place, with two emails focusing on two individual goals. "It has a two-fold goal. One is to encourage repeat purchases to get these customers who bought with us to come back and buy with us again. And then a secondary goal with that is to encourage users to share their purchase," Gardner said. 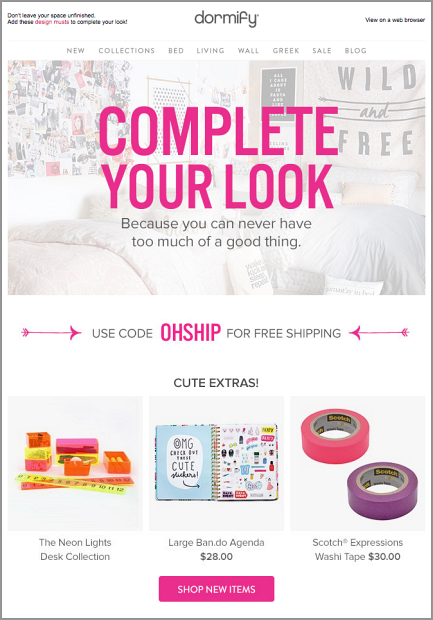 The first email focuses on the first goal, encouraging customers to "Complete Your Look." 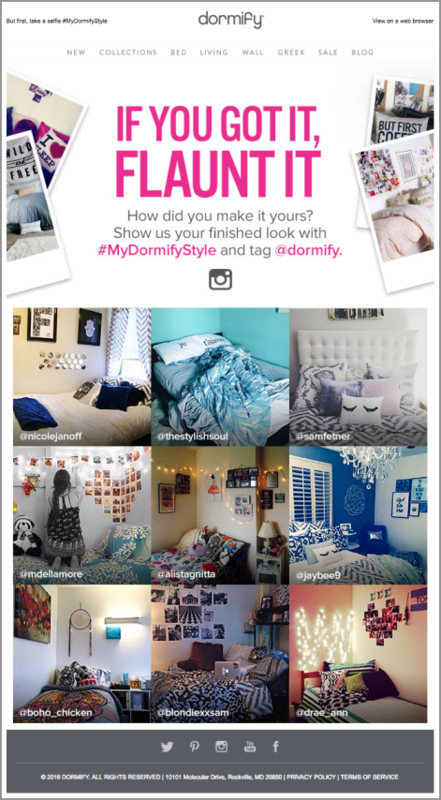 The second email promoted a hashtag, #MyDormifyStyle and encouraged customers to post on Instagram, and includes posts other customers have published on Instagram. "We have a call-to-action within an email that encourages them to share their space on social media. That's actually been really, really successful for us because we see, especially with that age group, they're highly motivated to show off what they've designed and decorated with the products that they've purchased," Gardner said. "We've definitely made changes over time. A lot of our changes have been either based on subject line testing or with changing the frequency … seeing how open rates can fall off over the course of a series. So we have adjusted how we leverage that," Gardner said. Many times, she said, her team will use a promotion as an opportunity to conduct A/B tests, "in which case we'll test the difference between including an offer in the subject line or including more of an abstract witty type of line instead." In terms of other testing, Gardner said that her team has recently played with the post-purchase series timing in particular. "We flipped the order of how we were sending them. And we've done that a few times. Sometimes we change it even more seasonally than anything else," she said, explaining that when not during the back-to-school time, they send at a different cadence. If a customer is ordering bedding products in June, she said, "We have a good sense they might not be purchasing or moving in until August or September. So that ‘Show Us Your Space' email, we might either adjust the timing or send a secondary reminder that's more timely at the time of move in." She and her team look at timing, subject lines and content on a monthly basis, she added, "really just looking at whether it makes sense still — from a branding perspective and creative — to the performance where things seem to be dropping off or changing or growing stale and adjusting as needed from there." When it comes to the growth of the email program, Gardner believes, "What we do really well is the timeliness of the messages, and the way that we're staggering our email communications." She added that efforts to split test email subject lines and segmenting to focus the email toward the most relevant recipients have "definitely helped a lot in making sure that our audience stays engaged and is getting really appropriate, relevant content. Whereas, I think in the past, we might have been oversending and putting too many different messages that might not all have been relevant into their inbox." Making these systematic changes has allowed Gardner and her team to "have a little bit more of a hands-off approach," and focus more on "segmenting more so that we can really easily have a similar piece of content, but we can tweak the subject line or headline to better fit a parent versus a student." "I think for us, it just makes us see more proof of concept of how we can do even more with emails," Gardner said. She and her team have made a lot of gains over the last year, but they don't plan to stop where they are. "We see so much potential and have so many ideas on what other kinds of automation and personalization we can do," she added. "It's definitely made that more of a priority in our organization to collect even more data from customers, really analyze their behavior some more, and to target the emails accordingly as we can without driving them crazy," she said. Even outside of email marketing, she added, "We have that kind of personalization approach to everything we do. That's definitely a big part of our brand and a differentiator for us."